Amos Decker and his FBI partner Alex Jamison are visiting his hometown when he’s approached by a man whose name he instantly recognizes: Meryl Hawkins. He’s the first person Decker ever arrested for murder. Though a dozen years in prison have left Hawkins aged and terminally ill, one thing hasn’t changed: He maintains he never committed the murders. Could it be possible that Decker made a mistake all those years ago? As he starts digging into the old case, Decker finds a startling connection to a new crime that he may be able to prevent, if he can put the pieces together quickly enough. Kiss the Girls and Make Them Cry, by Mary Higgins Clark. When talented journalist Penelope “Casey” Harrison starts to research a piece about the #MeToo movement that includes an incident in her own life which she has been trying to put out of her mind for years, she does not realize that the young man who drugged and assaulted her at a fraternity house party in college is now a wealthy, powerful industrialist on the eve of a merger which will make him a billionaire–and who will do anything, even murder, to cover his tracks. Never Tell, by Lisa Gardner. Coming February, 2019. Conrad Carter is dead in his home office, shot three times. His computer has been shot twelve times, and when the cops arrive, his pregnant wife is holding the gun. D. D. Warren arrives on the scene and recognizes the woman–Evie Carter–from a case many years back. Evie’s father was killed in a shooting that was ruled an accident. Flora Dane sees news of the murder on TV and immediately knows Carter’s face. She remembers a night when she was a hostage and her captor knew this man. Overcome with guilt that she never tracked him down, Flora is now determined to learn the truth of Conrad’s murder. But D.D. and Flora are about to discover that in this case the truth is an elusive thing. As layer by layer they peel away the half-truths and outright lies, they wonder: How many secrets can one family have? Before She Was Found, by Heather Gudenkauf. For twelve-year-old Cora Landry and her friends Violet and Jordyn, it was supposed to be an ordinary sleepover. But when they decide to sneak out to go to the abandoned rail yard on the outskirts of town, little do they know that their innocent games will have dangerous consequences. Later that night, Cora Landry is discovered on the tracks, bloody and clinging to life, her friends nowhere to be found. Who would want to hurt a young girl like Cora–and why? In an investigation that leaves no stone unturned, everyone is a suspect and no one can be trusted–not even those closest to Cora. The A List, by Judith A. Jance. Ten years ago, when Ali Reynolds’s high-profile newscaster life blew up on the West Coast, she went back home to Sedona, Arizona, to reinvent herself. Now while she’s living her new life, someone from her past comes asking for help. But will revisiting the past jeopardize her future? Two Weeks, by Karen Kingsbury. Cole Blake, son of Landon and Ashley Baxter Blake, is months away from going off to college and taking the first steps towards his dream–a career in medicine. But as he starts his final semester of high school he meets Elise, who captures his heart from day one. Soon after the semester starts, Elise discovers she’s pregnant and Cole, in love for the first time, is determined to support her–even if it means skipping college, marrying her, and raising another man’s baby. Elise decides to place her baby up for adoption, but as the due date draws near, she becomes focused on one truth: she has two weeks to change her mind. Her decision changes everyone’s plans. The Tinderbox, by Beverly Lewis. On the day before her Amish parents’ twentieth wedding anniversary, nineteen-year-old Sylvia Miller stumbles across the key to the old brass tinderbox her father keeps in his Lancaster County watch repair shop. Piqued by curiosity, Sylvia unlocks the cherished heirloom, not realizing that what she is about to discover will splinter apart her happy life. Can the Millers find a way forward through the turmoil to a place of forgiveness and acceptance? Far and Away, by Fern Michaels. Ever since Sophie De Luca and her second husband Goebel moved into their new home, Sophie has sensed something a little . . . unusual. Old houses often contain items left behind from previous owners, but what remains here is a painful secret. Facing this past presents a special kind of challenge, but with three extraordinary friends by her side, Sophie is ready to confront a terrible wrong that occurred within the house decades ago. And, just maybe, each of the lifelong friends will get the chance to claim a sweet, surprising future chiming with wedding bells when the task is done . . . Miracle at St. Andrews, by James Patterson. Though nobody has ever identified a single secret–no universally accepted truth–to the sport, every real player searches for one. Travis McKinley is one such seeker. A former professional golfer who feels like he’s an amateur at the rest of life, he makes a pilgrimage to the mythical greens at St. Andrews. On the course where golf was born, every link, hole, fairway–even the gorse–feels like sacred ground. Ground that can help an ordinary player, an ordinary man, achieve a higher plane. 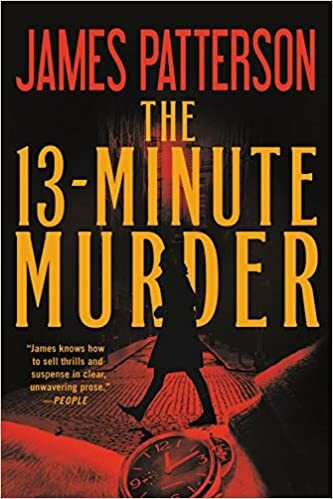 The 13-Minute Murder, by James Patterson. DEAD MAN RUNNING: Psychiatrist Randall Beck specializes in PTSD cases–and his time is limited. Especially when he uncovers a plot to kill a presidential candidate. 113 MINUTES: Molly Rourke’s son has been murdered–and she knows who’s responsible. Now she’s taking the law into her own hands. Never underestimate a mother’s love. 13-MINUTE MURDER: He can kill anybody in just minutes–from the first approach to the clean escape. His skills have served him well, and he has a grand plan: to get out alive and spend his earnings with his beloved wife, Maria. The 18th Abduction, by James Patterson. For a trio of women teachers, an innocent night out after class ends in a deadly torture session. They vanish without a clue — until a body turns up. To solve the School Night case, Lindsay Boxer turns to her best friend, investigative journalist Cindy Thomas, as the chief of police and the press clamor for an arrest. While Lindsay is investigating, her husband, Joe Molinari, meets an Eastern European woman who may have seen a notorious war criminal — long presumed dead — from her home country. Before Lindsay can verify the woman’s claims, Joe’s mystery informant joins the ranks of missing women. Lindsay, Joe, and the entire Women’s Murder Club must pull together to protect their city, and one another, not from a ghost — but a true monster. Triple Jeopardy, by Anne Perry. Young lawyer Daniel Pitt must defend a British diplomat accused of a theft that may cover up a deadly crime. Daniel and scientist Miriam Croft travel to the Channel Islands to chase a fresh lead, and what began with a stolen necklace turns out to have implications in three far greater crimes–a triple jeopardy, including possible murder. Neon Prey, by John Sandford. Clayton Deese looks like a small-time criminal, muscle for hire when his loan shark boss needs to teach someone a lesson. Now, seven months after a job that went south and landed him in jail, Deese has skipped out on bail, and the U.S. Marshals come looking for him. Then, they step onto a dirt trail behind Deese’s rural Louisiana cabin and find a jungle full of graves. Now Lucas Davenport is on the trail of a serial killer who has been operating for years without notice. His quarry is ruthless, and–as Davenport will come to find–full of surprises . . . The Decision, by Wanda Brunstetter. Coming March, 2015. Moving from Pennsylvania, finding rewarding work, and leaving heartbreak behind is the best decision Jonah ever made. But is he ready to consider love again when he meets Elaine? Will his scarred heart mend when she chooses family loyalty over love? Piranha, by Clive Cussler. Coming May, 2015. While attempting to solve a centuries old mystery, Juan Cabrillo and his crew uncover a traitorous American weapons designer who wants to rule the largest empire the world has ever known. Solitude Creek, by Jeffery Deaver. Coming May, 2015. Get ready for the third installment in the Kathryn Dance series. The Murderer’s Daughter, by Jonathan Kellerman. Coming May 2015. Psychologist by day, adrenaline junkie by night, Grace Blades has a very dark past–one that’s about to bleed into a terrifying present. The Love Letters, by Beverly Lewis. Coming March, 2015. Marlena Wenger has been sent to assist her widowed Mennonite grandmother for the summer, and unexpectedly also has to care for her infant niece. See what this does to Marlena’s relationships. In Plain Sight, by Fern Michaels. Coming February, 2015. The newest addition to the Sisterhood series, this novel has the Sisterhood taking on a distant cousin of and close adviser to the President of the United States. Miracle at Augusta, by James Patterson. Coming April, 2015. An unknown amateur wins the PGA Senior Open at Pebble Beach, but he can’t shake the feeling that he’s a fraud who doesn’t deserve his success. After a series of disappointments and personal screw-ups, he might prove himself right. Then comes his shot at redemption. Gathering Prey, by John Sandford. Coming April, 2015. Members of an itinerant group of homeless people, the Travelers, are disappearing. Lucas Davenport and his stepdaughter Letty embark on a journey that will not only put the two of them in danger-but just may change the course of his life. A Harvest of Hope, by Lauraine Snelling. Coming March, 2015. Just weeks into her year-long nurse training at the Blessing Hospital, Miriam Hastings is called home to Chicago, where her mother is gravely ill. Her supervisor allows her to continue her training in Chicago, but gets a promise that Miriam will soon return to fulfill her commitment. While in Chicago, Miriam can’t get Trygve Knutson and Blessing out of her mind. No matter how hard she tries to put it off, Miriam has some life-changing decisions to make. Country, by Danielle Steel. Coming June, 2015. Stephanie Adams is a stay-at-home mother, married to a lawyer in northern California, in a dead marriage she’s stayed in for years for the sake of her children. Then her fifty-two-year-old husband dies suddenly and all bets are off. She meets a country music megastar and realizes the power of seizing the day. Cuba Straits, by Randy Wayne White. Coming March, 2015. Doc Ford’s old friend, General Juan Garcia, obtains a collection of letters written by Fidel Castro between 1960-62 to a secret girlfriend. First Garcia disappears, and then the man to whom he sold the letters. When Doc Ford begins to investigate, he becomes convinced that those letters contain a secret that someone, or some powerful agency, cannot allow to be made public. A lot happened between Cuba and the United States from 1960-62. Many men died. A few more will hardly be noticed.